Exciting times! And what a generous offer, as I can imagine posting from Japan must cost a small fortune. I’ve signed up and wish you the very best of luck and joy with your launch! Thanks so much, Marina! You are very sweet. I so appreciate people’s interest in reading the book, so it’s totally worth the sending cost from Japan! Signing up as well – I’m always looking for new travel stories to take me away from my armchair! Thanks so much, Too Mutch! So appreciate your interest! Ooh, how wonderful! Do I enter just by commenting here? I would love to win an ARC! Hi Susan! Signup is actually here (http://www.tracyslater.com/contact/), but I think we already connected on Twitter about this, so no worries. 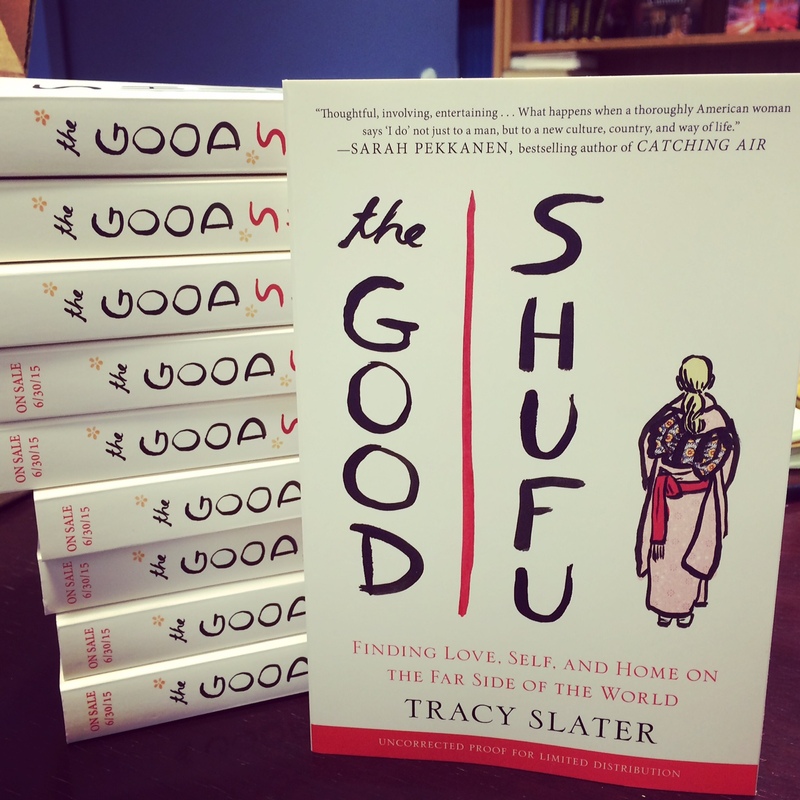 Hope people like The Good Shufu as much as they’ve liked your Good Chinese Wife! Thank you so much, Tracy! Yes, I have been getting your e-mail updates for a long time now. I know everyone will love your book and I can’t wait to spread the love! Hi, Tracy! Hope you and the Shogun and your mini-me are well. I think I entered… by signing up for your mailing list? Yes–thanks, Ann! I’m going to change the wording on that page to make it clearer. Right now the explanation is at the top but I think it’s getting lost in the layout, so I’ll try to change that. Tx for your question! Made me realize I need to make that page clearer. Hope you’re well! Sounds like a great read that I can relate to… Congratulations any good luck on the success of your book. I hope I win a copy. Hi Jennifer! Thanks so much for your comment. It’s a blind drawing, but I’ll keep my fingers crossed for you, too! Yay for the chance of getting to read it sooner! Win or not, I’m so looking forward to it finally going on sale. Thank you, Osakadays! Not sure if I knew you in Osaka, but know you are a total peach just from your message here. Thanks so much for your support–it means a lot! And oh how I miss Osaka! If you’re there, have some okonomiyaki for me. Just not the same in Tokyo… All my best! Thanks, Erinn! And very cool avatar, by the way! Thanks again for your support and interest in the book. Really appreciate it! Exciting! Can’t wait to read. Thanks, Jennifer! So appreciate your kind words and your enthusiasm. All my best to you! So nice to meet you! I have never heard of you until I noticed this website from Susan’s Facebook page! Congrats on the new book, I hope that it is successful. 🙂 I have subscribed to your blog. All the best! Thanks so much, mariadeng! So nice to be connected with you here. And I’m grateful for your interest and your good wishes for the book. Looking forward to keeping in touch! Pick me! Pick me! I want the book! Thanks so much, Lauren! And great to know about your site! Just signed up to follow you on twitter… All my best! would love this book, story of my life! I think I might be gifting this book a lot. So funny, Beth! Sadly, it’s *stlll* the story of my life after 10 years in Japan! Just cannot master the language. Anyway, thanks so much for your interest and your kind words. Really appreciate it! i hope one of them gets to Napa! Me too, Hilary! In fact, hope *I* get to Napa! Very jealous on this cold, dark, windy day in Tokyo. All my best, and thanks so much for your comment! What a great idea Tracy! I just shared this around with my friends! Thank you *so* much, Jocelyn! I wasn’t sure Putnam would let me do the giveaway, since they technically own the book’s distribution rights now until (or if!) I sell back my advance, but they very kindly allowed me to do this, and it’s already been a lot of fun getting comments and emails from lots of new people. Anyway, I so appreciate your support, as always! Thanks, Alison! I really appreciate your interest in the book! All my very best! Stefanie, thanks so much! We’re doing the drawing this week and will post the info here. It got delayed b/c I’ve been ill but am back at work now. Thanks again!